A decorative bridge surrounded by Spring blossoms, makes its way across the waterway flowing through the Halifax Public Gardens in Nova Scotia, Canada. The pathways in the Halifax Public Gardens in Nova Scotia, Canada are beautiful when the Spring blossoms arrive bringing fresh scents throughout the gardens. 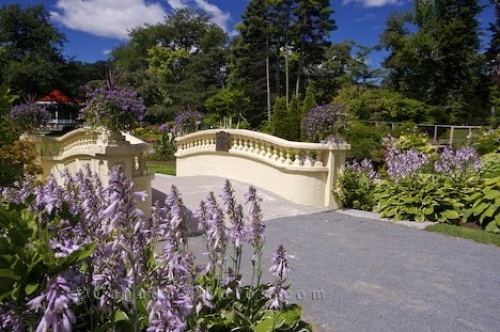 Cross the decorative bridge where the Band Rotunda is located and a mixture of Spring flowers come to life in the various flower gardens adorning the landscape. Decorative bridge at the Halifax Public Gardens along Spring Garden Road, downtown Halifax, Halifax Metro, Halifax Harbour, Nova Scotia, Canada. The Halifax Gardens were opened to the public in 1875. Please let me show you more of my pictures from my "photo gallery: Halifax City Photos". Picture of a bridge leading to the beauty of the Spring blossoms at the Halifax Public Gardens in Nova Scotia. Pictures from photo gallery "Halifax City Photos"